Effective 18thAugust2017, passengers holding full fare Airport Route Cotai First Class Tickets will be entitled to the use of our VIP LOUNGE whilst waiting to board. Our VIP Lounge located at the waiting hall offers complimentary self-service Coffee machine, bottled water, shoe-shine machine, charging stations, WIFI access, newspapers & magazines. 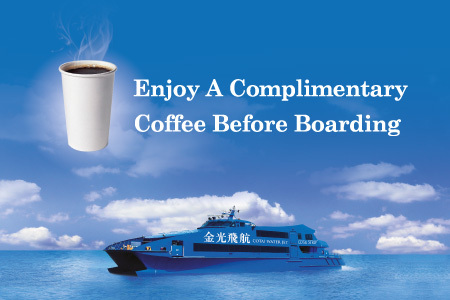 This campaign only applies to the passengers who purchase Macau Taipa ferry terminal to Hong Kong International Airport sailings Cotai First full fare adult ticket. Eligible passengers present your ticket to the Seat Allocation Counter staff to gain access to our VIP Lounge to relax and enjoy the ambience & amenities. Cotai Water Jet will not be responsible for any tickets that is lost or stolen and no replacement will be entertained. Cotai Water Jet reserves the right to change or discontinue this promotion without notice. This Campaign is subject to Terms & Conditions of Carriage of Passengers and luggage. Cotai Water Jet reserves the final rights to this Campaign.